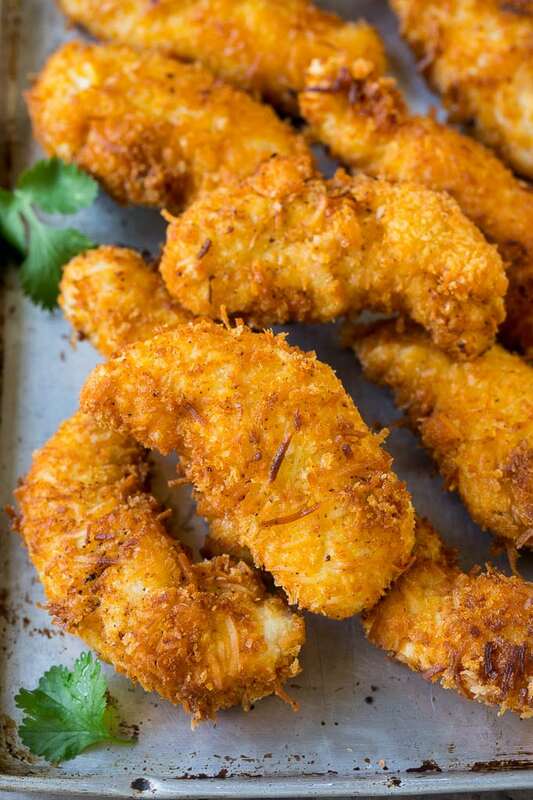 This coconut chicken is chicken tenders rolled in a sweet and savory coating, then deep fried to golden brown perfection. A restaurant style appetizer or main course that’s super easy to make at home. 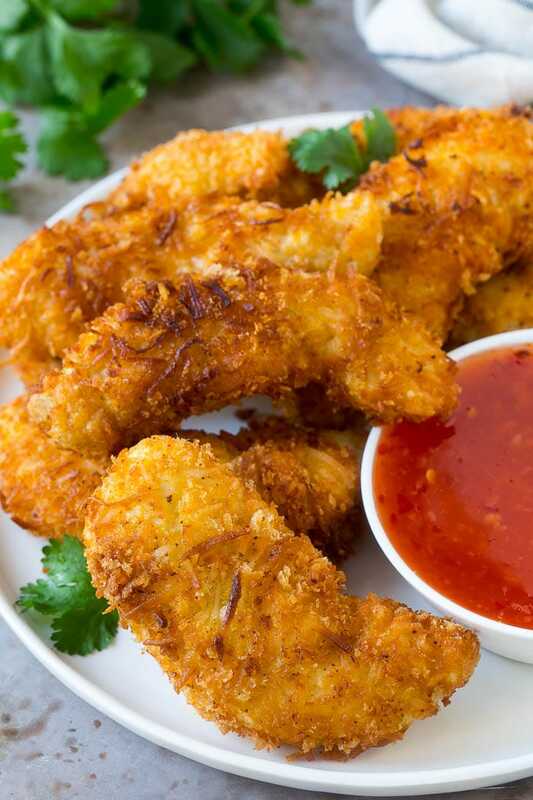 I love to recreate my restaurant favorites at home, including cream cheese wontons, egg rolls, and this ultra crispy coconut chicken. 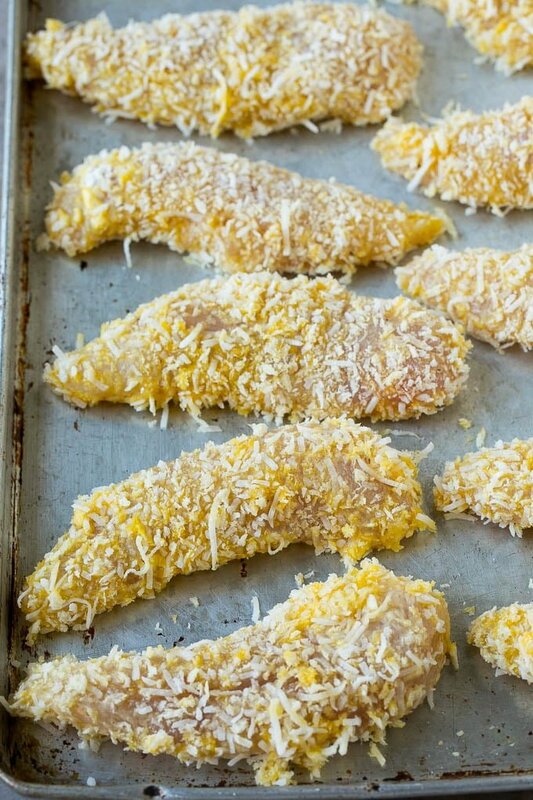 Chicken tenders are great, but they’re even better when they’re made tropical with coconut! Coconut chicken seems like it would be difficult to make, but it’s actually quite simple with minimal ingredients required. I love to serve my chicken on a bed of coconut rice with a side of steamed veggies for a complete meal that my family goes crazy over. HOW DO YOU MAKE COCONUT CHICKEN? This recipe calls for just a handful of ingredients. 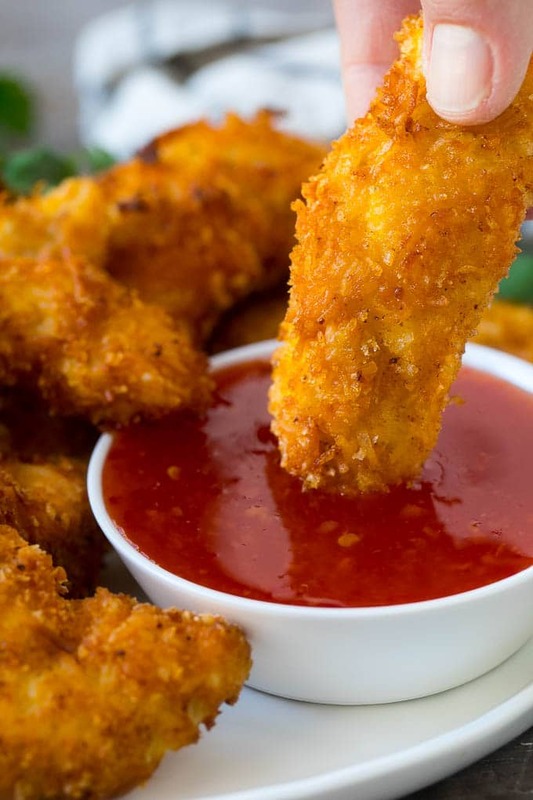 Chicken tenders are dipped in seasoned flour and egg, then rolled in a mixture of panko breadcrumbs and shredded coconut. The chicken goes into a pot of oil to fry, then you’re ready to eat! Use a thermometer to make sure your oil is at the correct temperature. You want your oil to be between 350 and 375 degrees F. If your oil is too hot, the coating might burn. If your oil is too cold, the breading will absorb more of the oil and become greasy. This chicken is best served immediately. If you need to reheat it later, you can bake it in the oven to crisp up the crust. 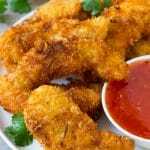 This recipe calls for chicken breast tenders, but you can also use cubed chicken breasts or thighs to make coconut chicken nuggets. If you use smaller pieces of chicken for nuggets, you’ll need to adjust the cooking time accordingly. You can use sweetened or unsweetened shredded coconut for this recipe. I personally prefer sweetened coconut, but either one will work just fine. Sweetened shredded coconut is commonly found in the baking aisle of most grocery stores. This recipe calls for panko breadcrumbs which is a type of Asian breadcrumb found at most grocery stores. I like to serve my chicken with a side of Thai sweet chili sauce, which can be found in a bottle in the ethnic aisle at your local grocery store, or at any Asian market. You can bake your coconut chicken instead of frying it if you prefer. The coating won’t come out quite as crispy and browned, but it’s still delicious! 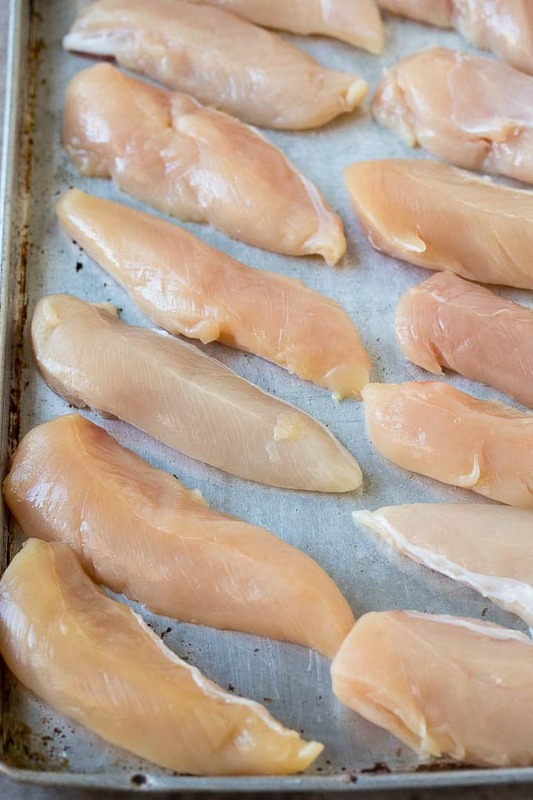 Arrange your breaded chicken on a greased sheet pan and coat the chicken with cooking spray. Bake at 425 degrees F for 15-20 minutes or until browned. Once you make coconut chicken at home, you’ll never want to order it out again! Whether you’re serving your chicken as a hearty appetizer or a main course over rice, it’s sure to be a hit. Place the flour in a medium size bowl along with the salt and pepper. Stir to combine. Place the eggs in a second bowl. In a third bowl, add the coconut and breadcrumbs and mix until combined. Dip each chicken tender first into the flour, then into the egg, then roll in the coconut mixture to coat evenly. Place each breaded tender on a sheet pan. Repeat the process until all of the chicken is breaded. Heat 3 inches of oil in a deep large pot to 350 degrees F.
Add 4 pieces of chicken at a time and cook for 6-8 minutes or until golden brown. Drain on paper towels. Repeat the process with the remaining chicken. Place the chicken on a plate. Serve immediately with sweet chili sauce and garnish with cilantro leaves if desired. I have never had coconut chicken but this looks AMAZING!!! Coconut chicken looks incredibly delicious! I have never even thought to try something like this. Next up I want to take a look at your cream cheese wonton recipe. this is giving me coconut ideas! we love the shrimp but never tried coconut chicken! Looks good and yummy. I can’t wait to try your coconut chicken recipe later. Thank you for sharing. Yummmm, this coconut chicken looks delicious! I’m always looking for a new chicken dish to try and I think I’ve found it! these sound just incredible!! kinda like coconut shrimp but with chicken (obviously). the photos are making me drool a bit over here! This sounds great! 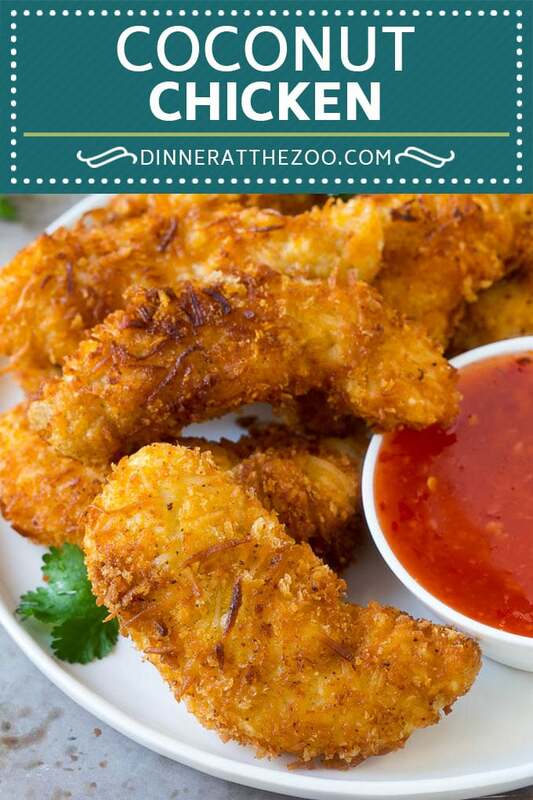 I haven’t thought about breading chicken with coconut, but we love the flavor! I bet my family would love this! I’m printing it out to make it for them soon. Oh my gosh, this looks so good. I am bookmarking this and making this recipe soon. It looks so good! I wonder how it would turn out in our air fryer.